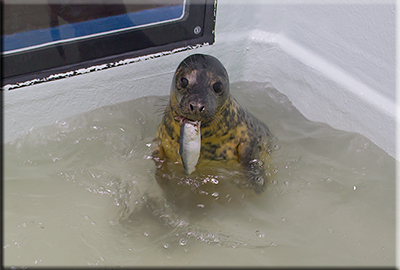 Aayla, female grey seal pup, was rescued from Bacton on 23rd January 2017. She was very small at only 13kgs and had nasty wound to her mouth which had become badly infected. 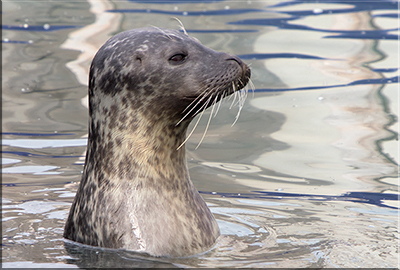 She also had some small wounds to her body, flippers and tail. 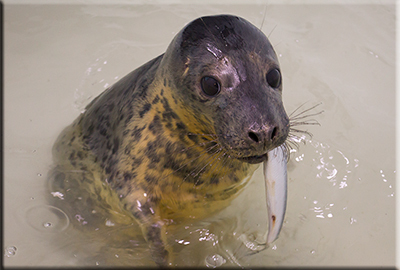 Update - 21st February 2017 : With lots of antibiotics Aalya is recovery well, she is already gaining weight and is eating fish whole for herself! 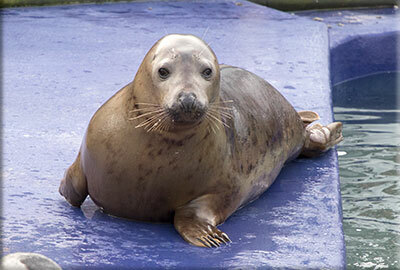 It shouldnt be too long before she can join some of the other rescued seal pups in the pup pool. Update - 21st February 2017 : Aalya currently weighs 16kgs and is still in the hospital. Click here to see a larger version of this and above photos taken on 19th February 2017. 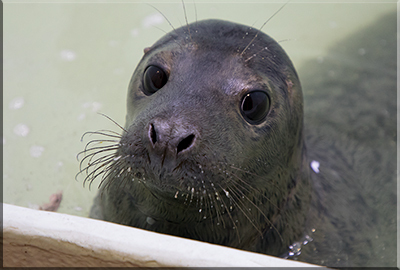 Update - 16th April 2017 : Aalya has been moved out of the hospital´s swim pool and back in to the pen as she is suffering from worms. Click here to see a larger version of this and above photos taken on 15th April 2017. Update - 29th April 2017 : Aalya is still in the hospital. 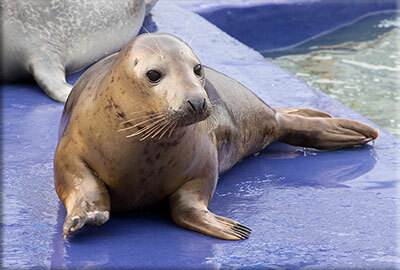 Aalya´s flipper tag number is 395 (white). Click here to see a larger version of this and further photo taken on 26th April 2017. 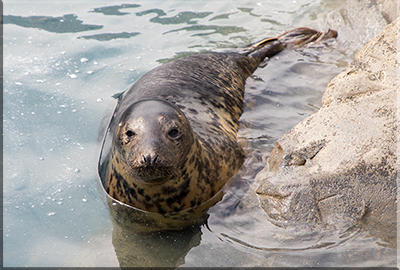 Update - 30th May 2017 : Aalya has been moved outside to the seal enclosure for her final stage of rehabilitation and to learn how to compete for fish with the resident seals before being released back to the wild soon. Click here to see a larger version of this and further photo taken on 28th May 2017. 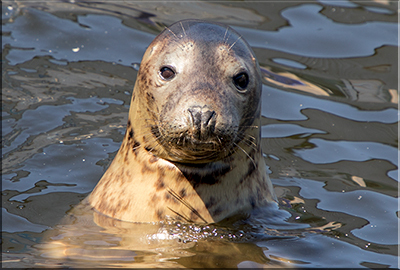 Update - 3rd July 2017 : Aayla has completed her rehabilitation and will be returned to the wild soon. Click here to see a larger version of this photo on 2nd July 2017. Update - 3rd September 2017 : This photo of Aayla was taken on 26th August 2017. 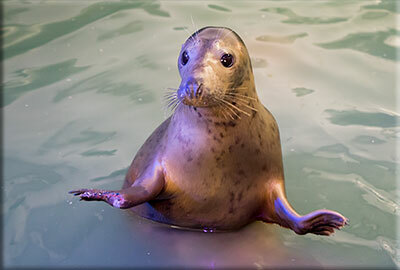 Update - 13th November 2017 : Aayla had an operation a few weeks ago to remove two digits from her front flipper. 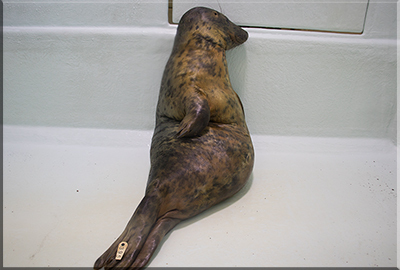 Once the stitches have been removed and the wound has healed, she will be returned to the wild, hopefully before Christmas. 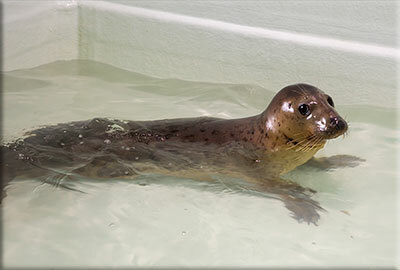 Update - 17th December 2017 : This photo of Aayla was taken on 16th December 2017 in the hospital´s swim pool. 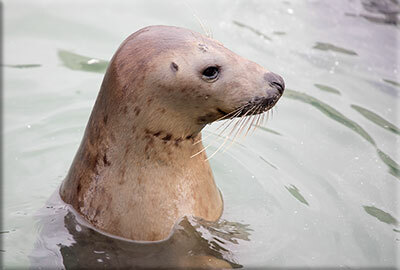 Update - 21st January 2018 : This photo of Aayla was taken on 20th January 2018 in the outside seal enclosure. 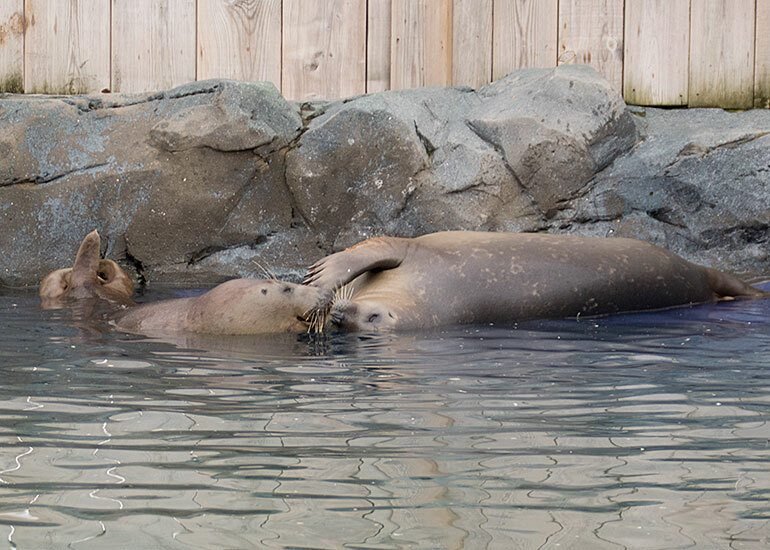 She is really enjoying herself being amongst the other seals. Update - 18th February 2018 : This photo of Aayla was taken on 18th February 2018, Click here to see a larger version of this. 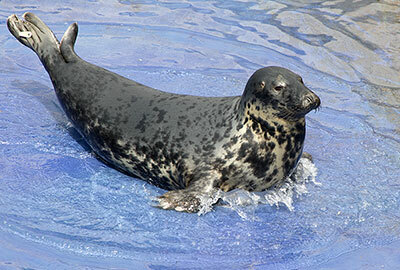 Although Aayla has been at the centre now for almost a year, she is very aggressive towards the staff which is a good sign for when Aayla is returned to the wild before Easter. Update - 11th March 2018 : This photo of Aayla was taken on 11th March 2018, Click here to see a larger version of this. Update - 9th April 2018 : Aayla and Silver are best friends. Click here to see a larger version of this photo taken on 7th April 2018. Update - 23rd June 2018 : Aayla looking very beautiful and stunning. Click here to see a larger version of this photo taken on 17th June 2018. 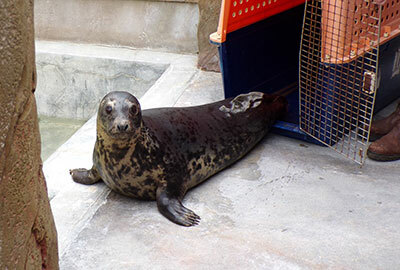 Update - 18th July 2018 : Aayla was moved to the Cornish Seal Sanctuary on 17th July 2018, what better place to go than sunny Cornwall where she will not only have the best possible care but she will have other new friends of her own age as Jinx and Willow.